Your fabrication needs are specific and unique. Opsrey Lightweight & Machine Ltd., located near Edmonton, AB, Canada, can help. Our shop specializes in one of a kind welding projects. Osprey currently has the only waterjet cutting table north of Edmonton, this machine will cut anything from Styrofoam, ceramic, wood, metals, and glass. Osprey's staff will put their ingenuity to work on your project! Osprey also has a team of very talented individuals who will use our machine and lathe, plate roll, brake, shear, and creativity to complete your custom projects. 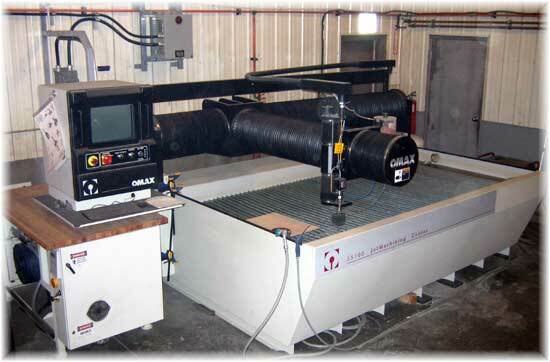 The waterjet has a 55" x 100" cut size, and is CNC controlled for accuracy. This machine will cut almost any flat surface, and allows us to create very precise designs for decorative/advertising needs, as well as machine applications.